Demand for wood pellet grills continues to grow. At this point, the market is flooded with a variety of options. Many of which do pretty much the same thing. The pellet hopper sends prepared hardwood pellets to the firepot via a carefully controlled auger system. An igniter and fan keep the fire burning consistently. This cooks the meat using indirect heat while imparting a gentle, pleasant, smoky flavor. Rec Tec is relatively new to the wood pellet grill category. Their founders knew that if they were going to put their hat in the ring, they needed to offer high-quality wood pellet grills that had some extra bells and whistles. 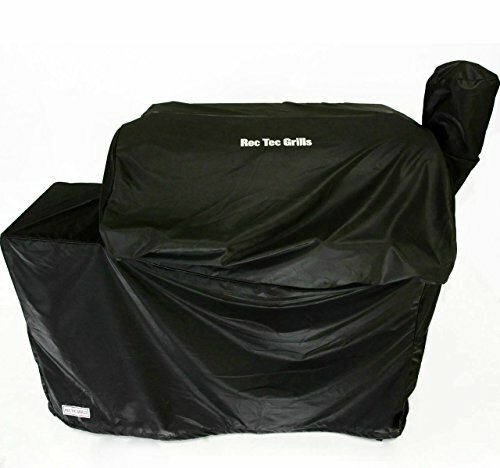 Enter the Rec Tec Bull, 700 Portable Wood Pellet Grill. Everything about it is designed and made to be heavy duty. 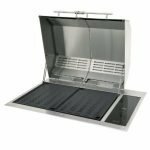 It uses heavy duty stainless steel throughout, with heavy-duty powder coating in all the right places. It even comes with lid handles that look like they could run you down in a bull riding ring! As a premium wood pellet grill, they assert that the Rec Tech 700 is the “King of the Mountain” in wood pellet grills. It features 2 digital meat probes that are integrated with the main controller. This allows you to closely monitor the food you are cooking without having to lift the lid. The controller also has a proprietary Smart Grill Technology™ PID algorithm for superior heat control. It can also be linked via a WiFi app to your smartphone, laptop or another wireless device. Their current, limited time promotion even includes a custom cover, as well as 160 complimentary pounds of wood pellets. 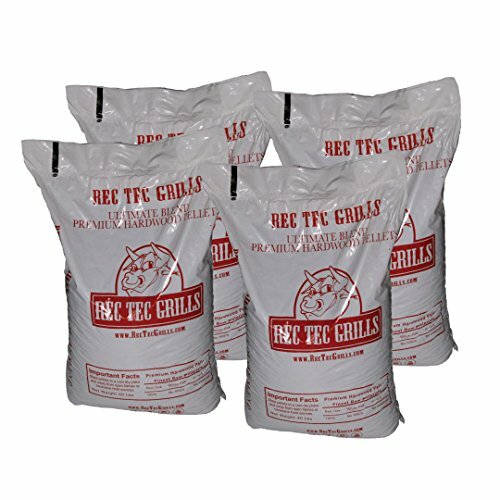 The Rec Tec founders knew that if they were going to throw their hat into the wood pellet grill marketplace that there was going to have to be no question when it comes to quality materials. They made sure to answer that in spades. The Rec Tec 700 is made with stainless steel, which is revealed in places for maximum visual appeal. Even the ceramic igniter responsible for the flame has been tested to last for 100,000 cycles. The base includes four heavy-duty locking caster, that all you to easily move the 200-pound Bull. 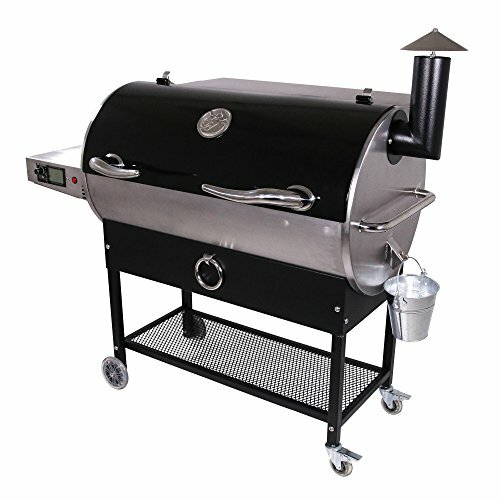 Like all wood pellet grills, the Rec Tec 700 Bull uses indirect heat and smoke to cook the food. It has a consistent temperature range as low as 200 degrees, to as high as 500 degrees Fahrenheit. This means at its lowest setting, you could potentially use the Rec Tec 700 Bull as a dehydrator for making your own extra-smoky jerky. Yet when it is preheated to its maximum temperature, the Bull can even be used to do things like bake cornbread in a cast iron pan or even make a grilled pizza. 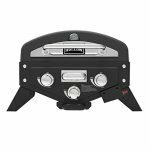 The Bull’s proprietary Smart Grill Technology™ uses a special PID algorithm for superior heat control. 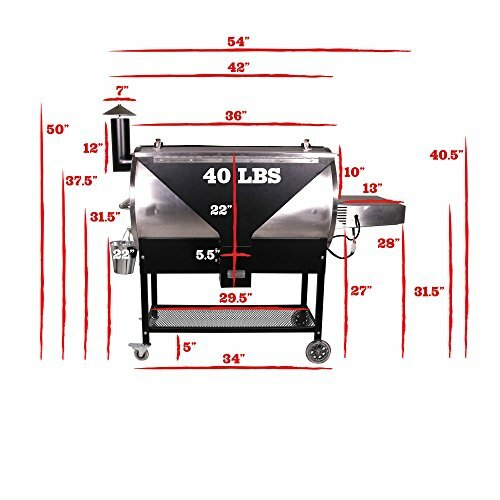 This means that it burns consistently, going through less of your complimentary wood pellets per hour than pretty much all other competitor wood pellet grills. On average the Rec Tec 700 Bull consumes 1 pound of wood pellets per hour when set at 225 degrees. One minor miss that you find with the bull is the lack of a broiler plate. 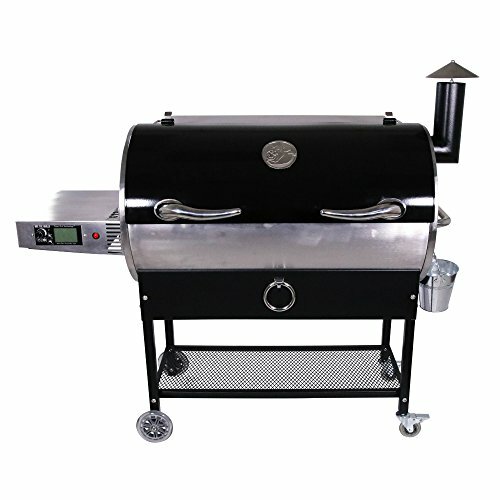 This is a relatively new development in wood pellet grills, that allows the user to expose some of the internal fire for direct heat grilling. One would suspect that Rec Tec will include a feature like this in some future version. For now, you can easily get around the lack of a direct heat searing option by using a cast iron griddle. So long as a steak is bench rested for 20-minutes, you should be able to sear it to a nice and smoky medium rare. As the name infers, the Rec Tec 700 Bull provides 700 square inches of space in the primary cooking chamber. 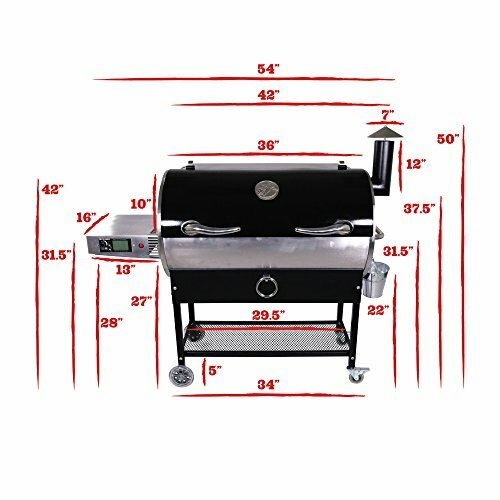 With thoughtful placement, you can load it with up to eight pork shoulders, or two large brisket flats. 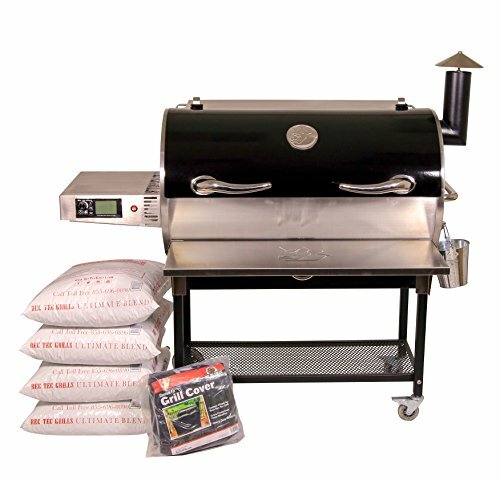 The Smart Grill Technology™ with its special PID algorithm maximizes heat and smoke control while also making the Rec Tec 700 Bull burn efficiently. The dual meat probes integrated into the digital controller is a nice touch. Some competitors only offer one, and some don’t even offer a single integrated probe thermometer. 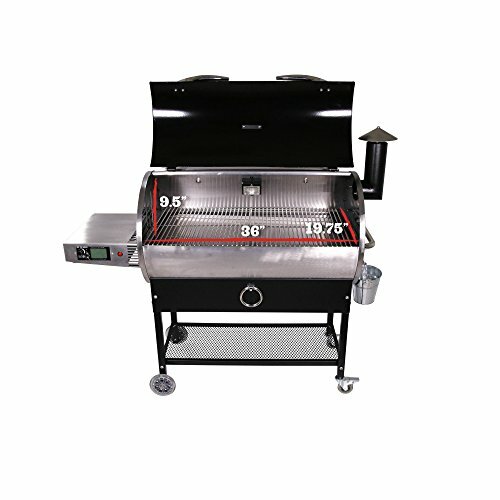 The WiFi connectivity app also allows you to monitor the temperature without having to spend all day hovering around the grill. One knock on this system is that the app itself will only alert you when the phone is unlocked. If your phone is just sitting dark in your pocket, it won’t send an alarm if the temperature of the grill rises or falls beyond the 10-degree target range. As a wood pellet grill, the Rec Tec 700 Bull is easier to clean than your average charcoal grill. The built-in Smart Grill Technology™ makes it more efficient. This means that you will have less ash to clean out of the fire pot. After cleaning out the excess ash and scraping down the grill grates with a nylon grill brush, you simply need to empty the reusable drip cup. Any excess wood pellets should be taken out of the hopper if you aren’t planning to use the Bull in the next day or two, or there is high humidity in the coming forecast. You can then cover it with the custom grill it comes with. The Rec Tec 700 Bull comes with a best in class 6-year warranty. It also has a 30-day satisfaction guarantee. 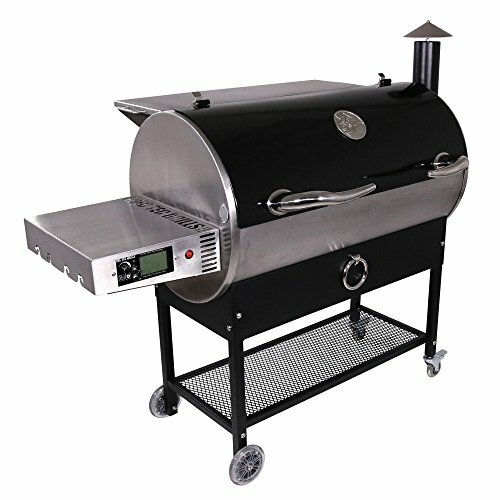 The Rec Tec 700 Bull charges into the wood pellet grill market with stunning looks, high-quality design, and efficiency. It brings a few more bells and whistles than the competitors as well as a superior warranty to back up their passion for quality. You also have to factor in the fact that the current promotion comes with a staggering amount of complementary wood pellets as well as a custom cover.